Done with low energy, mood swings, persistent acne and difficult periods? My 4 Week Hormone Balancing Meal Plans will help you achieve your best hormones ever! Are you over having to constantly deal with symptoms of hormone imbalance and dreading your monthly cycle? Tired of trying to figure out what is the best foods to eat for your hormones? Need simple meals to avoid binging on the foods that hurt your hormones? My 4 week Hormone Balancing Meal Plans have got you covered! This 4 week meal plan takes all the guess work out of what to eat, while saving you time in the kitchen — allowing you to enjoy your time doing things you love. I know you’re crazy busy. And I know that figuring out which foods will help you elevate your mood, your energy and your life can feel exhausting. 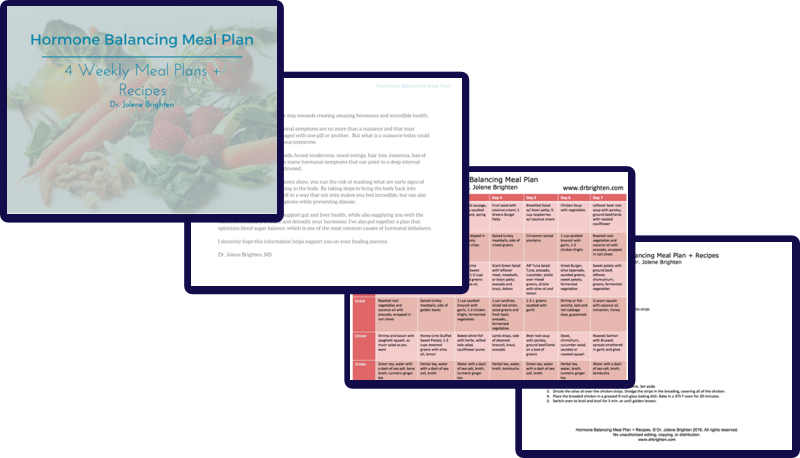 And I found that by adopting these meal plans myself I was saving time, reducing stress and consistently eating better every day. 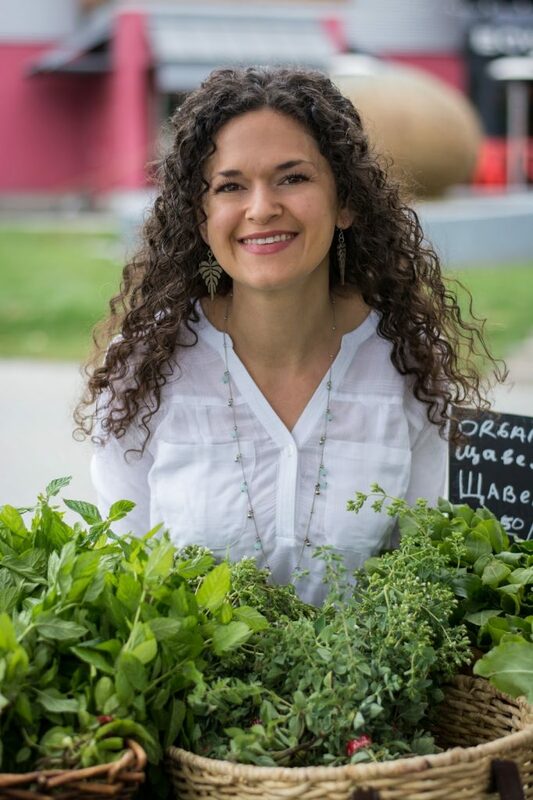 Using my experience as a doctor and holistic nutritionist, I've constructed these meal plans to effectively balance blood sugar, detox your excess hormones and increase production of the hormones you need most! 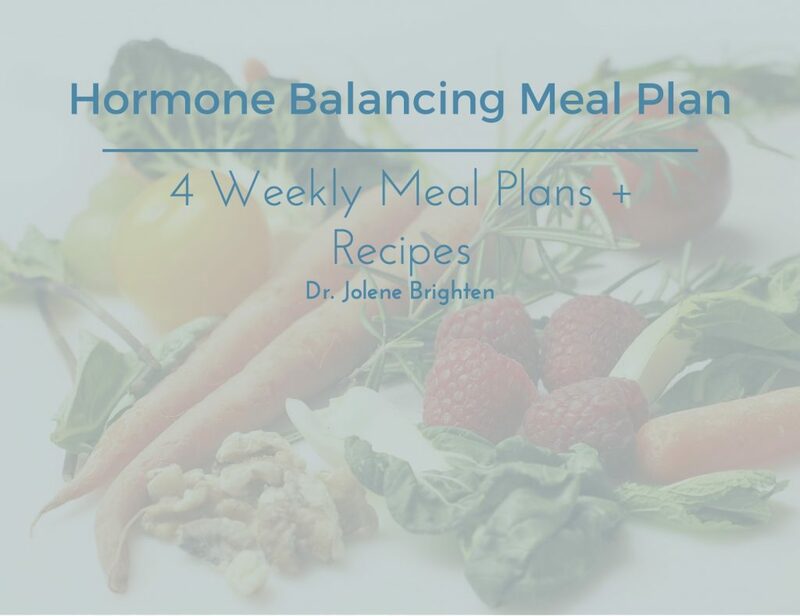 Each 4 Week Hormone Balancing Meal Plan has everything you need to plan and prepare your meals for the next 4 weeks, using proven, hormone balancing techniques that will bring your hormones into alignment without the stress and frustration of deciding what to eat. Say goodbye to after meal crashes, “hangry” episodes, and the afternoon slump. And say hello to a better mood and more energy throughout the day. The recipes and meal plans are designed to support your natural detoxification pathways, which results in noticeably better skin, more energy, easier periods. These recipes are not just good for you, they taste good too! Created by a holistic doctor, who also happens to be a foodie, these meals will leave you feeling satisfied — while also helping you look and feel your best. For less than $1 per day, these meal plans take the guess work out of what to eat and puts some powerful food at the end of your fork. Quite frankly, I’m fed up with nutritional obscenities harming women and keeping them confused about what to eat. Nutritional obscenities… not as in your turkey might start cussing at you… I’m talking about the terrible lies and myths women have been told about their diet. You know exactly what I’m getting at here — the latest fad diet, the new media spin on the most recent research, and the newest celebrity diet trick. All of these things pollute our minds with misinformation. This misinformation does damage… to our health, our hormones, our self image, and our lives. And it makes eating more complicated than it needs to be. It’s easy to see how we can find ourselves avoiding the foods that are beneficial, while eating in a way that damages our hormones. Everyday, women sabotage their libido, mood, and hormones by following common nutritional obscenities. I know — I was one of them. I killed my libido by subscribing to the “fat is bad” myth. My periods, mood and breasts suffered while I indulged the “soy will save you” fad. And you know what? I’m not the only woman to have done it. In fact, I have a whole practice full of women who have done damage to their body all because they were confused about what to put at the end of their fork. So, I’m here to tell you, eating to create amazing hormones is not complicated once you get started. But I want to be honest, getting started is the most difficult part. Which is why I want to help you and other women like you who are struggling with acne, mood swings, difficult periods, and other hormone symptoms get started on a path that will improve your hormones & your health. I want you and every woman to know that you can have amazing hormones, more energy, clear skin, easy periods, and a super chill mood… and your diet is exactly where you need to start. It’s time we take charge of our own lives and banish these nutrition myths that hurt our hormones and our lives. These meal plans are more than just a way of eating. They are an opportunity for you to own your health and be free from the confusion society has created around food. If you’re looking for a quick fix, one-size-fits all approach or a miracle food… you won’t find it here. Instead, you’ll find sound nutritional information, new self confidence and a critical self awareness about the foods you eat. And you’re going to feel a whole lot better for it! Cooking can be intimidating! Which is why I want to assure you that you do not need to be a master chef or cooking expert. You just need whole foods, a kitchen and a belief that you can do this… and I know you can. The meal plans are designed to be simple, delicious and non-intimidating. Your meals will be clearly structured every day to take the guess work out of what to eat. Plus, the recipes are designed with your busy schedule in mind to boost your success in the kitchen. Why am I sharing these meal plans? They all had one thing in common — their diet was sabotaging their hormone success. And knowing how and where to start was holding them back. But once they had their diet dialed in, I watched patient after patient improve. And it became apparent that the patients who had support and successfully made the dietary changes got better faster… way faster. They made the commitment to feed their body what it needed to heal. But in the early days, I also witnessed their frustration. Not knowing what to eat or not planning ahead would get the best of them and inevitably they’d be ordering take-out or grabbing whatever they could to curb their hunger. The answer was simple and the results were tremendous! Providing a plan for not just the day, but for the entire week reduced anxiety, freed up time and helped my patients feel successful with their diet. And they felt better — increased energy, feeling a real sense of joy and love, libidos returned, anxiety diminished, and women were telling me they once again felt comfortable in your their own skin. Feeling comfortable in your own skin and in love with your life are invaluable… and can be achieved simply by honoring your body with the nourishment it is screaming for. I’m sharing these simple, healthy and health transforming Hormone Balancing Meal plans with you because you not only deserve to feel your best — you have the power to make that dream a reality. You are struggling with mood swings, low energy, acne, irregular or painful periods, headaches or other hormone symptoms. You're ready to take charge of your health. You've tried everything and are ready to commit to eating whole foods. You feel lost about what to eat. Trust me, you're not alone. You value your health and yourself enough to go all in on eating a hormone balancing diet. I want to honor you if you're in this camp. You're committed and determined to leveraging food as medicine and committed to giving yourself and your body the nutrients it needs to thrive. You're not willing to cook. Look, if you know there isn't a chance you'll make a meal then I'm not going to ask you to commit to this. You hate vegetables — like won't even look at them without pitching a fit or gagging. These meals plans include lots of vegetables. You're a vegan or vegetarian. It's not that you can't make substitutes, but I want to be fully transparent that the recipes and meal plans contain meat. And I won't guarantee you'll see the same benefits if you do substitute. If you believe you can out supplement or out medicate a poor diet. It's not that I want to discourage you, in fact, I want you to get really honest with yourself and only buy this meal plan if you're truly willing to do the work. I hear you, making a commitment to eat better can feel like a big one. But I promise you, it will be the best decision you’ve ever made! Sure you could put this off until you’re really ready, but ask yourself — are you willing to spend one more day feeling fatigued, irritable, or anxious? For less than $1 per day, you can grab your 4 Week Hormone Balancing Meal plan NOW! If you’re on the fence… And because I’m SO passionate about getting this amazing, life-changing stuff in your hands today… I want to eliminate ANY doubts you may have about whether or not to buy. I’m so confident you’ll love these meal plans, I’m going to give you TWO FULL WEEKS after you buy to decide if you want your money back. If for any reason you’re not 100% satisfied, all you have to do is drop me a note telling me how long your committed to the eating plan and what didn't work for you at [email protected] and I’ll get back to you within 3 business days. Do the recipes contain gluten or dairy? No, you will not find any gluten or dairy in the meals plans or recipes. Both of these foods are known to cause inflammation, make acne worse and disrupt your hormones. Is it possible to follow the Autoimmune Protocol (AIP) diet with these meal plans? Yes, there are many AIP friendly recipes included. All of the recipes can be modified to meet your AIP needs. Do the recipes call for meat? In the interest of being fully transparent, I want you to know that yes, the recipes and meal plans do include meat. Yes, you can substitute or omit animal products, but you may not get the same results. I 100% support you making your own dietary choices and want to be honest about what’s inside my meal plans so you can make the best decision for you. What if I have a gut infection or digestive concerns? These meal plans are designed to support your gut by feeding good bacteria and encouraging proper elimination. As always, you want to check in with your doctor to determine if these meals are right for your individual needs. What if I can’t afford to eat 100% organic? This is a common question, with a simple solution — do the best you can. Use the Environmental Working Group’s Clean 15 and Dirty Dozen guides when shopping. Make everything on the Dirty Dozen list organic and worry less about those on the Clean 15 list. When can I get more meal plans? I love that women are asking this question. Currently, I am working away on other hormone supporting materials and do have plans to create more nutrition resources. I promise, you’ll be the first to know when these are available. What if I need more dietary support? No worries, some women do need more support. You are always welcome to contact my clinic to schedule an appointment with a functional medicine practitioner and get the one-on-one support you need.